In our era of self-profiling, it may seem normal for an author to make themselves known in the first line of their work, but it was quite the opposite in the Middle Ages. In Dutch-language literature of the thirteenth century, there is only one other example: the mysterious Willem, “who made” Reynaert. Jacob van Maerlant, who wrote this poem, to send as a tender gift, wants people to call this book Der naturen bloeme in Dutch. Maerlant actually has every reason to place himself in the foreground. Not only did he already have an impressive body of work behind him when he wrote The Flower of Nature, but this book was a remarkable effort, a comprehensive overview of all that was known about creation during his age. Nature processes past the reader’s eyes in alphabetical order over the course of thirteen books of very different lengths (a total of about 17,000 verses): diverse human beings, four-legged animals, birds, water monsters (like the crocodile and the mermaid), fish, snakes, insects, “ordinary” trees, spice trees, herbs, springs, stones and metals. No other writer had ever done this before in the vernacular, not in the Netherlands and not even in Europe. So that is why Maerlant – in another unusual move for the thirteenth century - proudly recorded the title of his work: der naturen bloeme, which simply means “the best of nature”. Maerlant based his work on Liber de natura rerum (Book on the Nature of Things), a Latin nature encyclopaedia that originated from 1241 and that was attributed – also by Maerlant - to one of the greatest minds of the thirteenth century: the Colognian Dominican Albertus Magnus. This attribution is incorrect: the work was actually by one of his apprentices, the Leuven Dominican Thomas van Cantimpré. It was certainly created entirely in the spirit of Albertus’ own work, which in turn was heavily influenced by the work of the Greek philosopher Aristotle, which had reached the West through Latin translations from Arabic. Aristotle’s fingerprints are thus to be found all over Cantimpré’s nature encyclopaedia (and, as a result, Maerlant’s book). This influence is evident from, among other things, the fact that natural phenomena are not treated solely as symbols that are meant to show the way to God - as was usual at the time. Instead, Maerlant focused on descriptions of natural phenomena and their practical uses. This was another way that The Flower of Nature was a pioneering work: laypeople were being exposed to a new science of nature for the first time. This certainly applied to the Zeeland nobleman Nicolaas van Cats, to whom Maerlant sent his poem as a precious gift. The work soon found its way to the clergy and wealthy citizens. 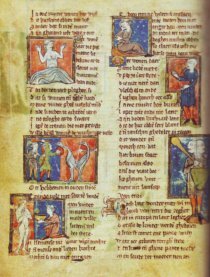 Maerlant was, in fact, a brilliant teacher who knew how to pare back and present a text that offered both knowledge and entertainment. He did so in verses that sounded so natural that verse would remain in use for the transfer of knowledge in Middle Dutch for far longer than in neighbouring countries. For the fourteenth-century writer Jan van Boendale, Maerlant was the father of all Dutch poets. He is in any case, a shining example to this day of how to bridge the gap between curiosity and science.